Bivouac is the latest in a growing list of two-year-old winners for the powerful Godolphin stable. Bivouac has added his name to the ever-growing list of Godolphin’s two-year-old winners while Time To Reign has left punters and connections wondering. A sibling to 2017 Golden Slipper winner She Will Reign, Time To Reign was the heavily supported $1.60 favourite in Saturday’s Listed Lonhro Plate (1100m). After travelling three-wide on the pace and seeming to over-race, Time To Reign could not meet the challenge and finished fourth, two lengths behind the winner, a $6.50 chance. Ridden by Blake Shinn, Bivouac was strong on the line to have a length to spare over Cosmic Force ($6.50) with Steel Diamond ($6.50) another long head third. 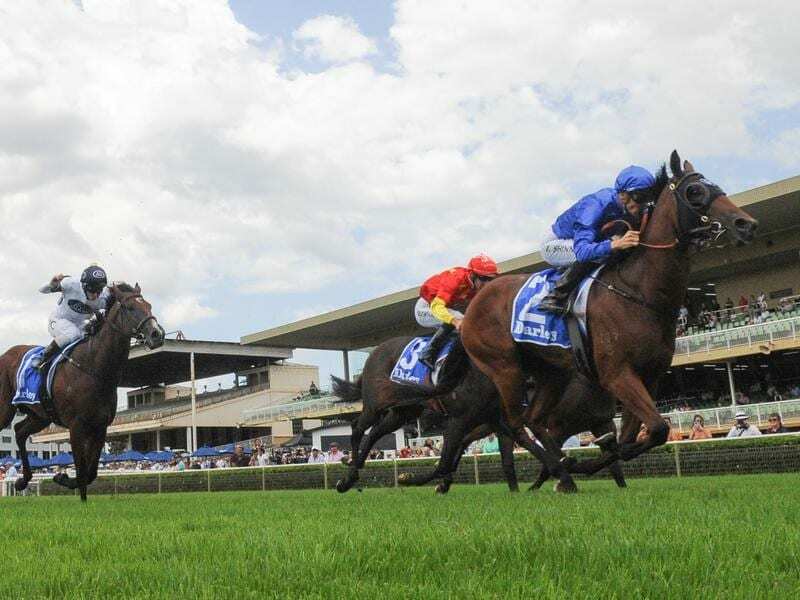 Bivouac was ridden by Blake Shinn who has claimed feature race wins for the past three Saturdays including the Expressway Stakes on Godolphin’s Alizee since his return from serious neck injuries suffered in a barrier trial fall in August last year. Shinn’s ride drew praise from Godolphin representative, retired champion jockey Darren Beadman who won 10 Group One races on Lonhro who stands at Sheikh Mohammed’s Darley Stud. “I told Blake to ride him similar to how he rode Alizee the other day,” Beadman said. “Alizee was one of his first rides for us in a while and he’s always shown he’s a great rider. Underlying the strength of Godolphin’s juveniles, Beadman said Bivouac probably ranked in the top 10. Although Time To Reign was beaten for the first time in three starts, jockey Tim Clark was forgiving. “He just raced a bit fresh early,” he said. “Being on a soft track and doing that left him a bit vulnerable late. I wouldn’t be hitting the panic button yet.